The Easter Bunny :: Where did he come from? I find myself often thinking about traditions and the origins from where they came. As we approach Easter Weekend I couldn't help but think about all the yummy leftover chocolate I will be eating from my nieces and nephews Easter basket's on Sunday. Then I got to thinking, how did we even come up with the Easter Bunny being associated with such a religious holiday? So...I googled it. (of course) and I came up with this easy to read article. He's fluffy, friendly, and oh, so fertile! Hippity, hoppity! Here comes the Easter Bunny with his basket of Easter eggs and other springtime goodies! How did an egg-delivering rabbit come to represent Easter, the resurrection day of the Savior? Actually, the entire Easter holiday has its roots in pre-Christian tradition. Early Christians adapted the Jewish Passover and pagan celebrations to mark their highest holiday of faith, in which the Old Testament prophecies were fulfilled by the death and resurrection of Jesus Christ. Where did Easter, or Resurrection Sunday, begin? The ancient Anglo-Saxons worshipped Ostara, a goddess of fertility. During the spring moon, or vernal equinox, tribal members would offer seeds and colored eggs on a fertility altar to please and appease this goddess. Christians transformed the word "Ostara" to "Easter" to mark the celebration of Jesus' resurrection in the springtime. This timing was both historical and logical, as the Last Supper of Christ was actually a celebration of the Passover Seder, which also occurs in the spring. How did Easter eggs become associated with Resurrection Sunday? Since early Roman times and before, people have regarded the egg as a symbol of new life. As a sign of Christian rebirth, the egg is ideal. What once appeared to be lifeless has sprung into new life. A bird hatching from an egg has been seen as a type of resurrection, even as Christ stepped out of the sealed tomb of death. Incidentally, in Greece, Easter eggs are dyed red, to symbolize the shed blood of Christ. Elsewhere, eggs may be colored in rainbowed hues for festive fun. In the United States and other countries, children participate in indoor or outdoor Easter egg hunts. How did the Easter Bunny traditions begin? Rabbits are among the most prolific of all living creatures. They exemplify fertility, as they may produce many offspring at one time. According to Anglo-Saxon mythology, Ostara (again, the fertility goddess) transformed a bird into a bunny, who laid colorful eggs for children. Thus began the tradition of a bunny giving children decorated eggs in the spring. In America, Pennsylvania Dutch settlers recounted stories to their children of the "Oschter Haws" (Easter Hare), who visited homes and left colored eggs for well-behaved children. Little boys would leave their caps, and little girls would leave their bonnets, as nests. In time, families began weaving and crafting baskets instead. In the 19th century, German confectioners began making Easter bunnies from pastry. Today, in the United States, families perpetuate the tradition of the Easter Bunny, who brings treats and trinkets to children. Many other countries have similar traditions. As real rabbits begin birthing their many young this spring, one cannot help but consider our great blessings. Aren't we fortunate that the Easter Bunny drops jelly beans and chocolate eggs, instead of what all those other bunnies leave in our yards? 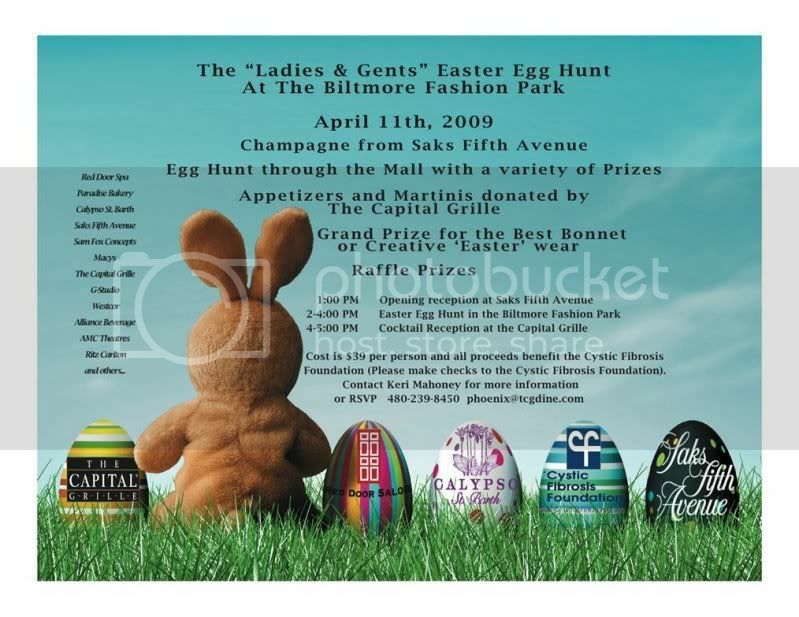 If you aren't planning to participate in an Easter Egg hunt yourself, think about attending this charity event tomorrow benefitting the Cystic Fibrosis Foundation. It's a grown up way to join in on the fun and give back to a cause that needs our attention. Happy Hunting! However you choose to celebrate I want to wish you a Happy Easter!